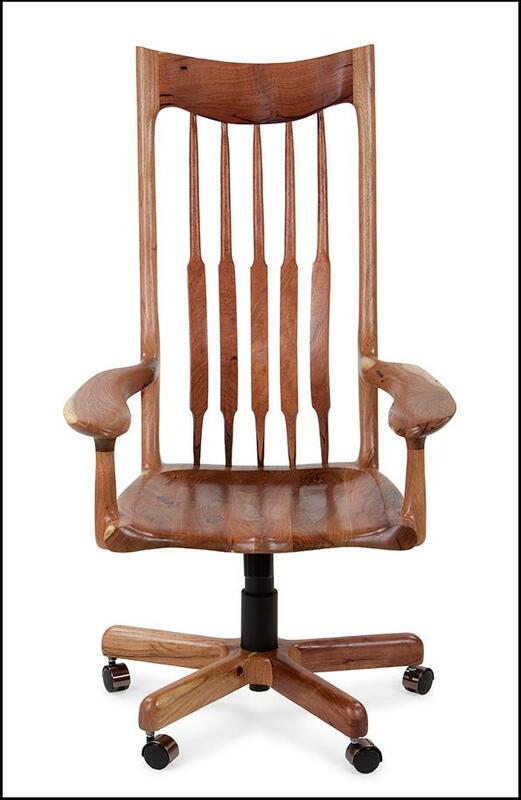 This new rocker design has been a long time coming. Scott has wanted to make this for over a year. And finally the timing was right to get it started. We wanted to break away from all the Maloof inspired rockers that are out there and we’ve had a few designs in mind, and this is the first of three that we plan on doing over a period of time (sorry the other two rocker designs will be a secret, till we create them and show them off). These rockers will be limited editions (only 10 total), so as to not have to many out there and therefore they will be more unique and valuable. Some of the new features are the flared out legs that go down to the runners. 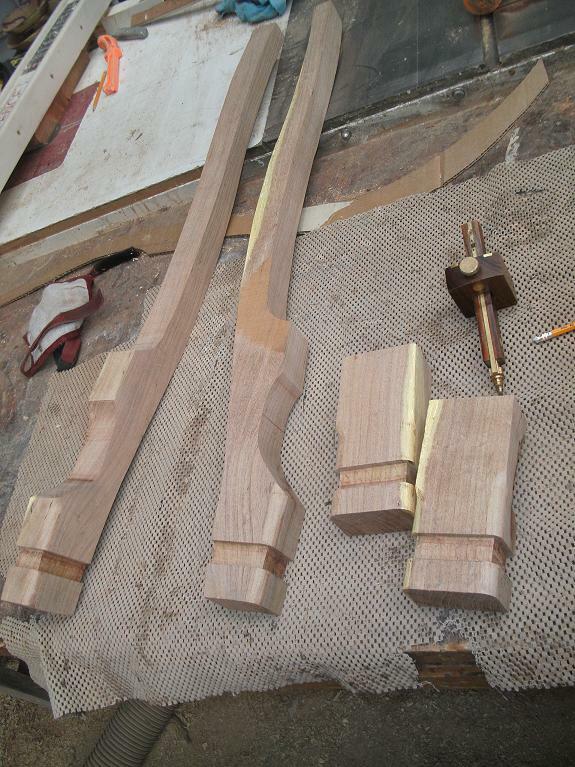 The legs also bend and bow out more, with even more handshaping involved. 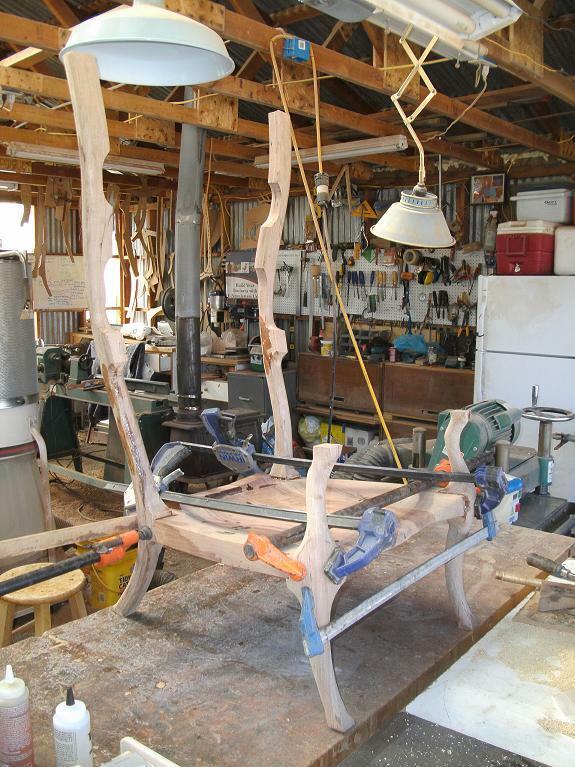 We still have the very comfortable carved seat, but since the lumbar support was completely different, thicker pieces of wood were used to be able to shape the seat into the lumbar support. 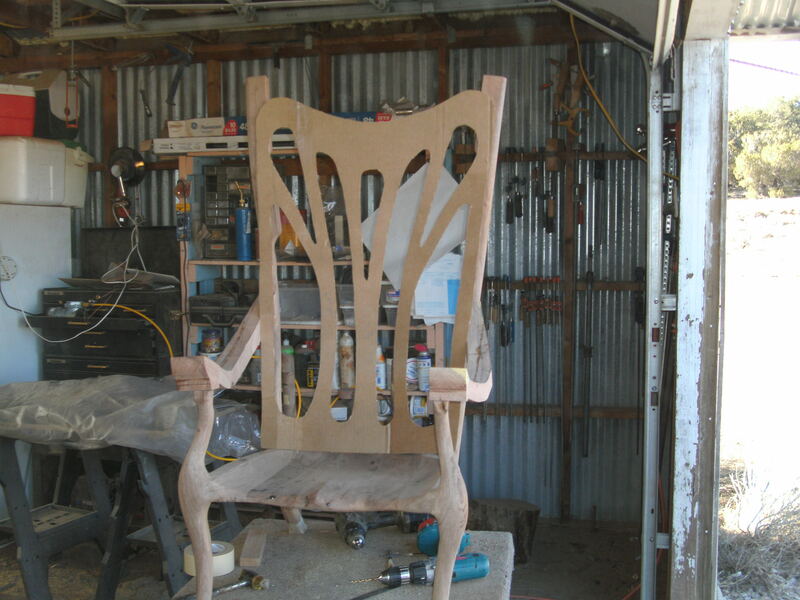 The back lumbar is all bentwood, to still give that wonderful support in the back while rocking, and they splay out towards and shape into the upper legs and headrest. 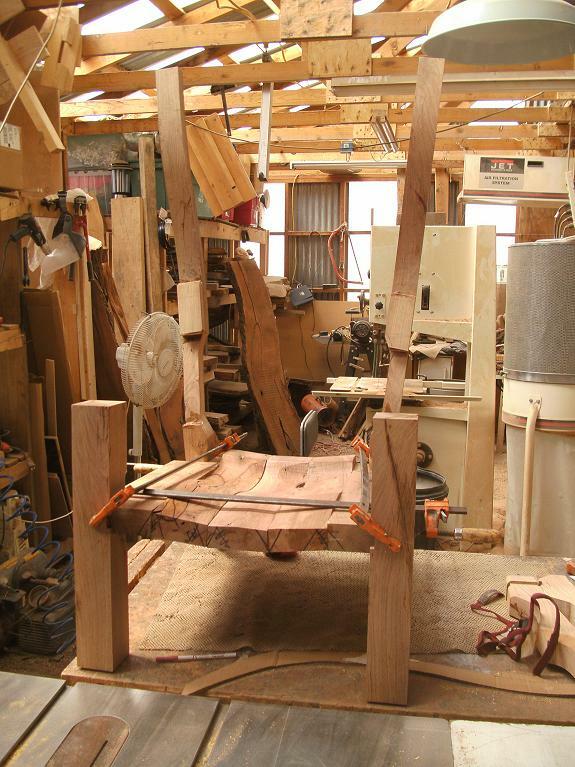 The headrest was made with the grain going the same direction as the rest of the rocker, so that it all flows very nicely. 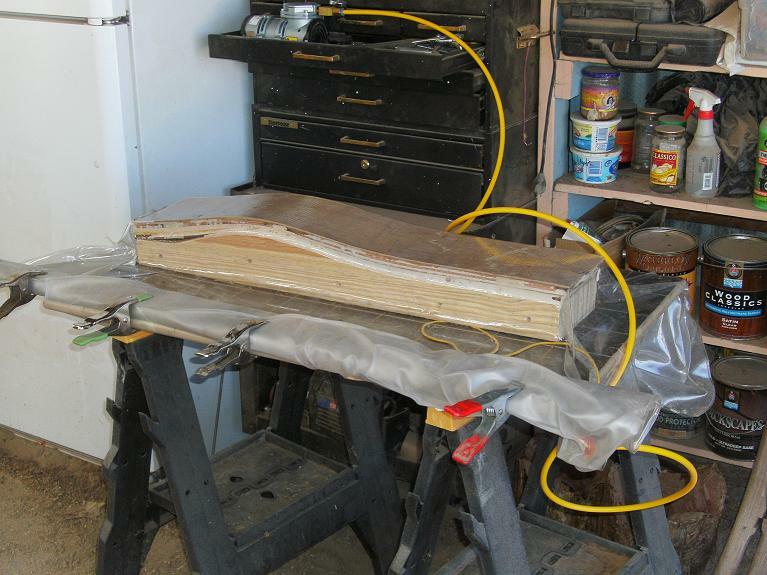 This meant cutting up pieces of wood that worked well together, cutting them to give them the curve effect that cups the head and gluing them up together. The glue up phase proved to be a challenge. But the affect is wonderful. The arms are shaped a little different and they have a twisting motion where they meet the front legs. There was a lot more handshaping involved, but that is Scotts’ favorite part (and most woodworkers least favorite because it’s so labor intensive). 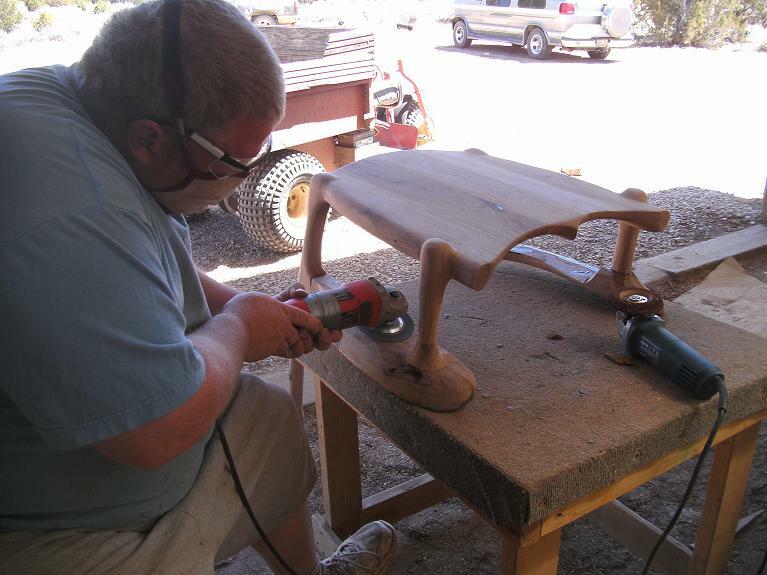 To see the finished photos, please go to the Shangrila Rocker on this blog or visit our webpage. 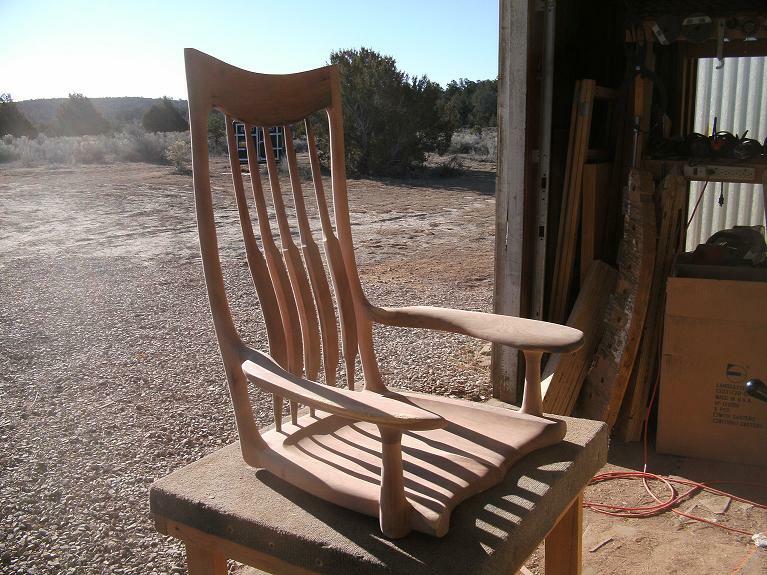 This mesquite desk chair was created for a customer from Texas. 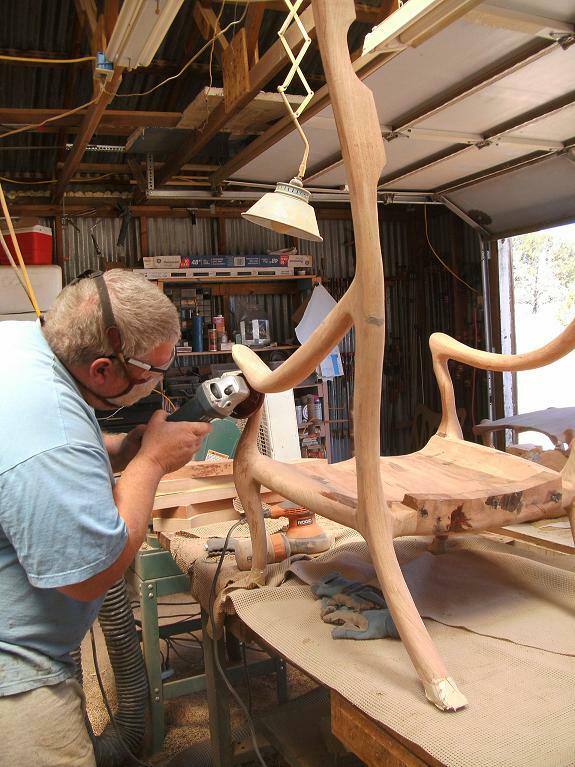 He wanted it to be all mesquite with the flat rocker style arms and small dog ears. 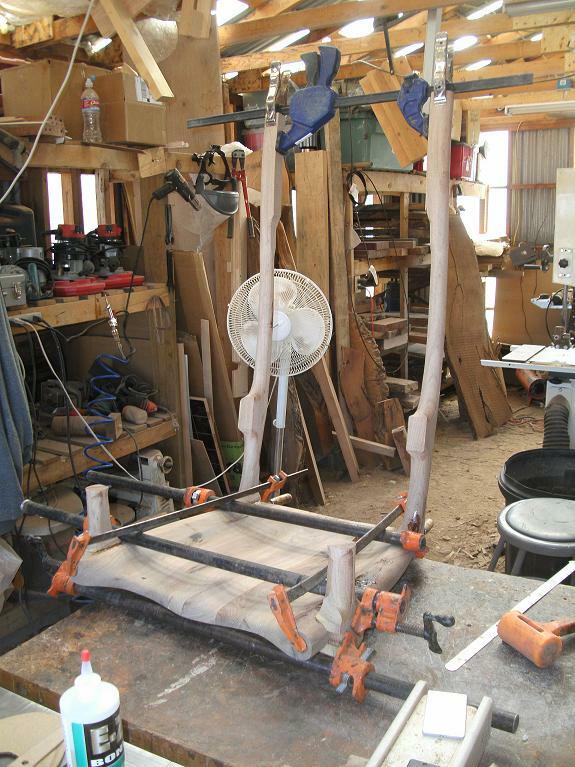 A new five wheel chair base mechanism was used. Since this base was solid steel and suppported the chair, the wood that layed over it was for asthetic purposes and there will be no worries about it cracking or having other problems in the future. The grain in this mesquite was incredible. 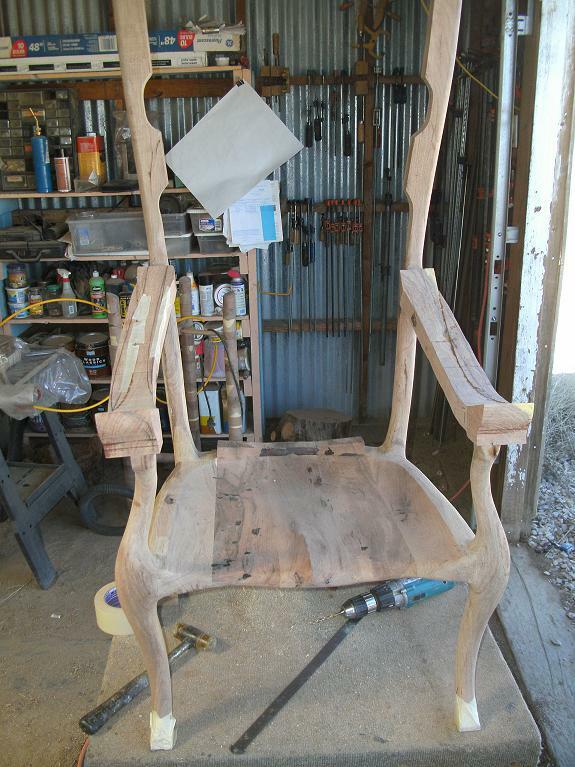 We incorporated some of the yellow sap wood into parts of the chair, making a beautiful contrast. This mesquite office chair was beautiful and we are very satisfied with how it turned out. Due to the inperfections in mesquite, we had to make some design changes to accomodate this. 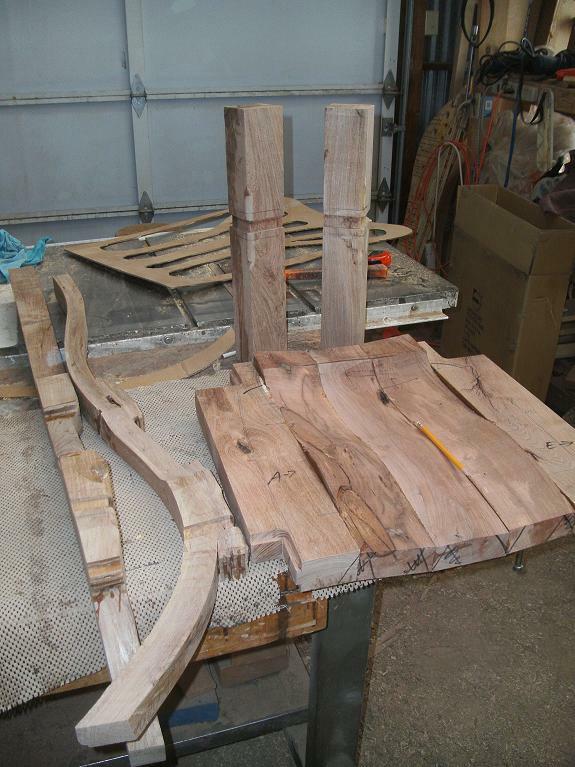 We did bentwood lamination for the back lumbar spindles. We have found that mesquite can have hairline cracks that may not be seen during the construction process or the completion of a piece. And since the spindles go to a small diameter where they meet the seat and headrest, these can be problem areas. 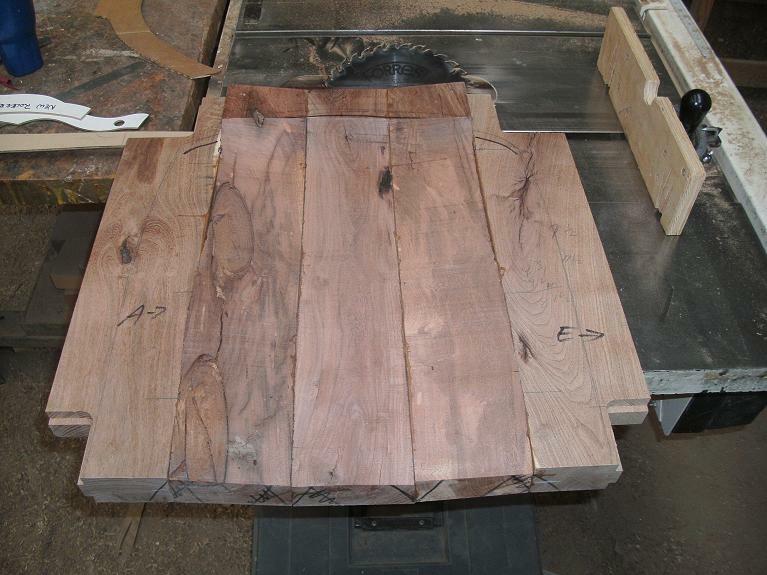 By doing bentwood lamination we could ensure that they would not be a problem in the future. The process takes a little longer and is more work, but will be well worth it. You are currently browsing the Shangrilawoodworks's Blog blog archives for May, 2010.